Ukraine's President expects the U.S. and EU leaders to join the conversation. Ukrainian President Petro Poroshenko has ordered the country’s Foreign Ministry to initiate phone conversations with Russian President Vladimir Putin, German Chancellor Angela Merkel, French President Francois Hollande, US Vice President Joe Biden and European Council President Donald Tusk, the president’s press service said. 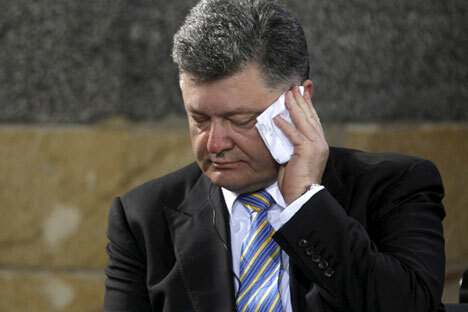 Poroshenko ordered to organize the phone calls after the Russian President Vladimir Putin criticized the Ukranian authorities for "turning to terrorism" in the wake of the announcement by the Russian Federal Security Service (FSB) about prevented terrorist attacks in Crimea. "The Foreign Ministry has to organize phone conversations with the leadership of Germany and France in a trilateral Normandy format and invite for the conversation US Vice President Joe Biden, European Council President Donald Tusk and initiate a conversation with Russian President Putin," the statement from Poroshenko office said. Poroshenko has also ordered Foreign Minister Pavel Klimkin to ask the Organization for Security and Co-operation in Europe (OSCE) Special Monitoring Mission to Ukraine to increase the number of monitors on the border with Crimea and to instruct the chief of Ukraine’s mission to the United Nations to hold consultations in the UN Security Council. Earlier on Aug. 11, Poroshenko ordered all units on the border with Crimea and on the contact line in Donbass to be at the highest level of combat readiness. Russia’s Federal Security Service said on Aug. 10 that it has foiled terrorist attacks in Crimea plotted by Ukraine’s Defense Ministry’s main intelligence directorate. A group of saboteurs was spotted on Aug. 7 near the city of Armyansk, close to the border with Ukraine. Two Russian servicemen died in an operation to detain the saboteurs. The aborted terror attempts were designed to target Crimea’s critical infrastructure and life support facilities, the FSB said. Russian President Vladimir Putin has described the attempted act of sabotage in Crimea as criminal.